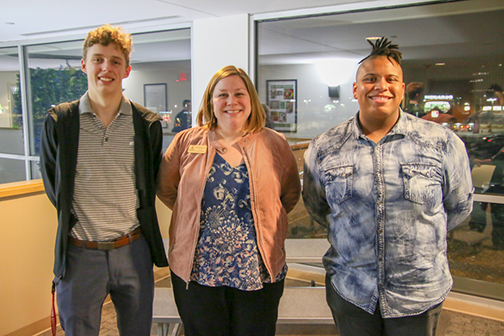 Read about the students and staff who were recognized at the Feb. 26 Board of Education meeting. Tyler Wright, a sophomore at Pattonville High School, earned the rank of Eagle Scout. Wright completed a beautification project at John Calvin Presbyterian Church and has earned 24 merit badges and served in leadership roles within his troop. Pattonville Thespian Troupe 1934 attended the Missouri State Thespian Conference in January. During the competition, Lacey Harder was named a Theatre for Life Scholarship finalist and competed in the Tech Challenge and group acting event. Two students were selected to perform during the All-State Opening Number. They are Emily Barton, who also auditioned for the 2020 All-State Show and competed in the duet musical theater event, and Alayna Hopgood, who also competed in the duet acting event. Many students also competed in challenges during the conference. Students who competed in the improv intensive event were: Kyle Craig, who also competed in the duet acting event and auditioned for an acting scholarship; and Kaitlyn Kelly, who also competed in the monologue individual event and auditioned for an acting scholarship; Jarred McCormick; Lydia McCullough, who also competed in the duet musical theater event; and Brittany Strasburger, who also competed in the short film event. 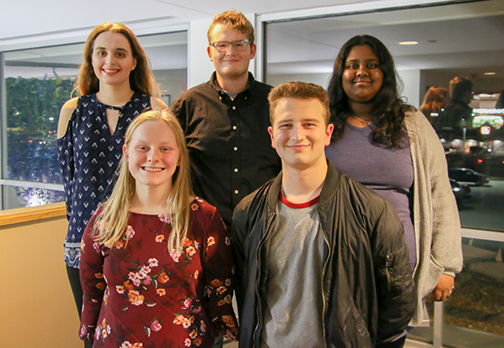 Other students who competed in the Tech Challenge were Aeeda Talukder, Elise Thompkins and Seth White, who both participated in the group acting event. Alonna Gibson participated in the solo musical theater event. Teacher Lara Corvera directs the thespian troupe. Michelle Miletic, a Special School District (SSD) social worker at Pattonville High School, was recognized with a 2019 Lasting Impression Award from SSD. The award recognizes SSD staff members whose extraordinary efforts make a difference in the lives of students, both within and outside of the classroom. Pattonville High School seniors Aric Hamilton and Will Polster; Dr. Cara Hiripitiyage, Pattonville’s director of secondary education; Dr. Tim Pecoraro, superintendent; and Mickey Schoonover, director of school-community relations, collaborated to write a chapter in the newly released education book “Designing Successful Systems: Volume 1.” Published on Feb. 20, the book is the first in a three-part series about innovation, creativity and change in education. Hamilton, Hiripitiyage and Polster participated in a book release party earlier this month, where they presented about their chapter of the book.